This page contain links to description page of stamps that directly related to Paleontology and Paleoanthropology science, stamps depicted dinosaurs and other prehistoric animals and plants, fossils and paleontologists. 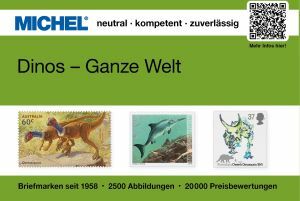 Description pages of stamps depicted fossil found places, Natural History Museums with significant collection of fossils and contributor to Paleontology or Paleoanthropology science are here. Brand new or modified pages are marked in bold.